Surefire is among the notable flashlight brands on the market. Surefire started its operations in the 1960’s and it has continued to develop over the years. As technology changes, so do surefire. In the past, surefire used to utilize incandescent bulbs in its flashlights but has now changed to Led lights. In short, surefire has kept up with the changes in the industry to bring its clients better products. Read this Surefire XC1 review and learn why buy this pistol light. One of the areas that flashlights are highly used is in shooting. It doesn’t matter if it’s for fun, hunting or for law enforcing, light is needed for the user to have a good aim at their target. As a result, surefire has specialized in creating lights that can be attached on guns to make the work of shooters to be easy and fast. In the past, one had to hold the light as they aim which could distort them or even make them miss. But with these pistol lights, one can attach it to the flashlight and take an aim without any interference. I have explained everything in this SureFire XC1 Review that you should know. Surefire has several pistol flashlights to offer like x300 and x400 light. But, one of the excellent models they offer is the surefire xc1. 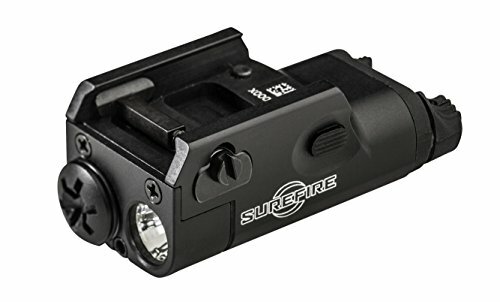 The surefire xc1 is the smallest and lightest weapon light from surefire. The flashlight is specifically built to be attached on railed handguns. It is durably constructed from high strength anodized aerospace aluminum. Furthermore, it produces a white light which is vital for concealed carry and other practices. The light weighs 1.6 ounces which makes it suitable for use on any universal handgun without being a burden. 2.1 What makes surefire a distinguishable brand? 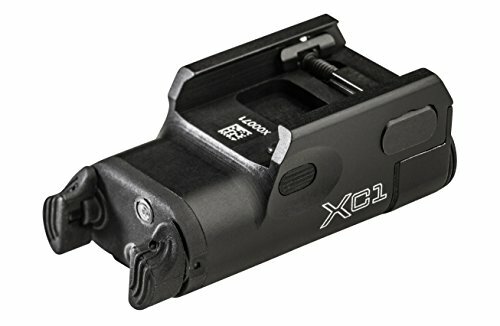 The xc1 weapon light has a maximum lumen of 300. It uses Led chip which is shaped by the multifaceted reflector into a wide, smooth beam for identifying threat at a close range. The beam pattern is evenly distributed and has no bright center. Also, it comes with ambidextrous switching that offers both momentary and constant on activation options. To achieve the momentary on activation, you have to place your support hand on top of the rear downward-activated switches and pushing it down. Alternatively, you can position your support thumb against the same switch and push forward until the switch toggles down. To turn, you just have to remove the pressure. On the other hand, constant on activation is attained by using your support hand to push the center crossbar switch from left to right. To switch off, push it from right to left. The surefire xc1 is powered by one AAA lithium battery. The pistol flashlight is made of durable aerospace aluminum body. This makes it to be extremely sturdy together with the hard anodized and a Mil-Spec finish. So, the light can withstand impact, bend, and crushing. The torch runs on one AAA lithium battery. This is a quality battery with a longer run time and power. Also, the battery is powerful and it can functions in adverse weather conditions like in cold or hot temperatures. XC1 is compactly designed for easy fitting on your railed handgun. Simply set it up on the rail and use the light to take your aim at a close range. Also, the compact design makes it suitable concealed carry use. It is lightweight and won’t weigh you down or add a lot of weight on the gun. The surefire light weighs 1.6 ounces together with the battery. Surefire xc1 produces very bright light that reaches far with its maximum 300 lumens white light. This enables the user clearly see an assailant from a distance. Using the flashlight is very easy and quick. This is because attaching it on most of the universal rail equipped handguns is very easy. The flashlight has a multifaceted reflector that creates a broad, smooth maximum vision beam for close quarter uses. Actually, the beam pattern is optimized for the human eye. It has integrated ambidextrous momentary and constant on switching for different uses. The momentary on switch can be used to blind or disorient an assailant in case of an attack. The led light is reliable for use in adverse weather conditions as it has a sealed gasket making it to be weatherproof. It is versatile in use and can be used by emergency responders, outdoor enthusiasts, law enforcers, and hunters. What makes surefire a distinguishable brand? Construction – surefire have its flashlights made from durable materials such as anodized aluminum and nitrolon polymer. These materials make flashlights made by surefire to be rugged, durable, and reliable in tough conditions. They can resist impact and crushing. The surefire xc1 is made from anodized aluminum which is a strong and durable metal. 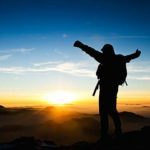 Power – one of the features that outdoor enthusiasts look for in a flashlight is its power. This is in term of the lumen it offers and how bight it is. Flashlights from surefire come with led bulbs which are powerful and light for longer hours than any other type of bulb. Also, surefire has its type of lithium batteries that are powerful and last longer than normal batteries. Versatility – a good number of flashlights made by surefire can be used for different uses. People like law enforcers, rescuers, outdoor enthusiasts and adventurers want reliable lights. Most of the surefire lights can be used for different purposes as they come with several features. The surefire xc1 is a great example of a versatile light that can be attached on the gun of a hunter, policeman, rescuer or even the military. 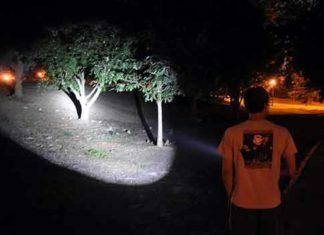 Ease of use – some flashlight users find it hard to use certain lights because of their complicated features. This is not the case with surefire flashlight brand. They make lights that are easy to use and hey provide directions on how to effectively use their lights. Also, the switch buttons are always perfectly positioned for quick and easy use of the torch. Reliability – if you are an outdoorsman, then you know the importance of having a reliable light. A flashlight can be the difference between life and death. Some flashlight brands cannot withstand the tough outdoor conditions. Surefire lights are built to function in different weather conditions. It doesn’t matter if it’s cold or hot, the light will still offer you the best outcomes. Although, the surefire lights may not work at 100%. The surefire XC1 is a simple and reliable weapon light. It comes with top features that make it to be ideal for outdoor use. It has a rugged design, produces a strong beam, and can be easily attached to a railed gun. Also, it is lightweight and won’t weigh down the user. Despite its small size, the 300 lumen should be bright enough to give you the light that you need on duty. Such features make the surefire xc1 to be a top performing pistol flashlight. Still, have a question after reading this SureFire XC1 Review? Comment below.